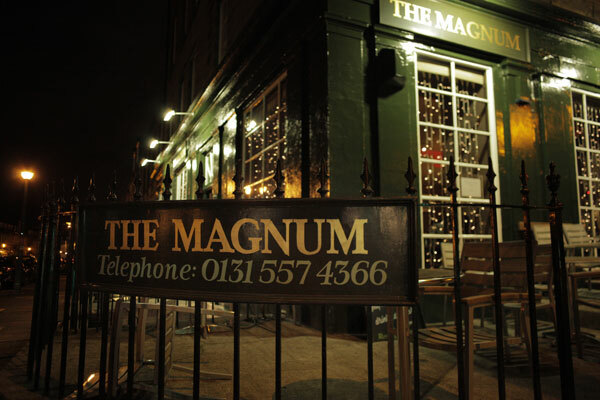 The Magnum is a well established Restaurant and Bar – it opened in 1981 – on the corner of Albany Street and Dublin Street in Edinburgh’s New Town. This is very much a “local” across a wide neighbourhood from Dundas Street and Abercromby Place down the cobbled hill to Drummond Place and the Broughton-Belllevue area. Ideal too for city visitors staying in hotels and guest houses nearby. 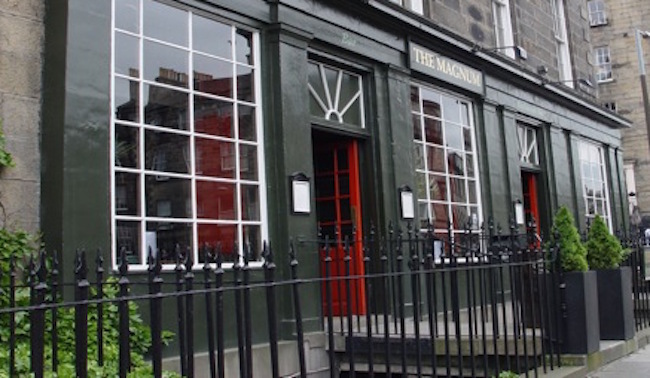 Its longevity and popularity is probably very much due to its location and to the quality food emphasing Scottish beef, fish and game as well as popular Bar dishes. Chef Paul Dow has been here for eight years which ensures a consistency in the standard of cuisine. From the outside the first impression is a traditional Pub, but step inside and, like the Tardis, the space opens out across three adjoining rooms, from the cosy Island Bar to the two dining areas. My friend Fiona and I were shown to a spacious window table overlooking Albany Street. The décor and furnishings give a smart yet casual ambience – comfortable leather chairs, polished wood tables, dark grey and red panelled walls. Artwork (for sale) has a maritime theme – perhaps reflecting the seafood on the menu. And of course the name of the Restaurant is illustrated with giant champagne bottles decorating the Bar. The celebration of drink and hospitality is also captured in quotations such as “Wine is Bottled Poetry” accredited to Robert Louis Stevenson, the poet, novelist and adventurous world traveller, who was brought up just a short walk from here, in a townhouse on Heriot Row. So what to choose for dinner? 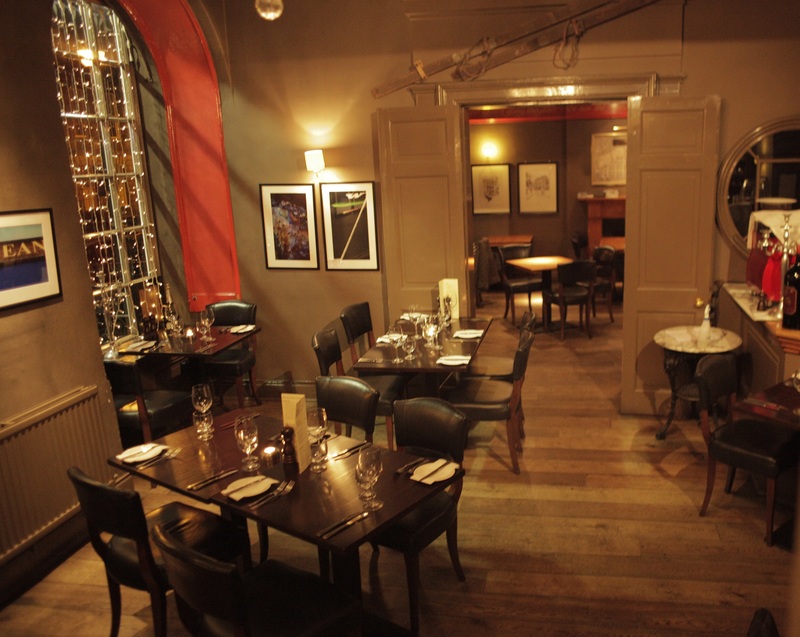 First a glass of Prosecco as the perfect aperitif to sip as we chat and browse the menu – Rabbit Terrine, Cullen Skink, Rib Eye Steak, Sausages, Beef Burger, Venison, Trout – there’s certainly a wide choice, (7 starters, 10 mains) but very limited for Vegetarians. 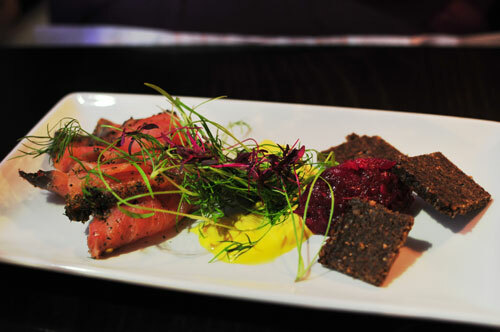 Fortunately, I am a Pescatarian … and cannot by-pass any kind of Smoked Salmon, so I select the platter of Beetroot cured Gravadlax – this has a rich, sweet flavour and artistically served with celeriac aioli and beetroot puree. The pumpernickel bread is rather dry, but we also had a basket of chucky soft bread which works better. Over the table Fiona is enjoying her Vegetarian Haggis, creamed potatoes and neeps, drizzled with a whisky cream sauce. This looked rather a hearty dish as a starter, but she assures me it’s light in texture and more importantly, delicious. The wine list is well selected with many by the glass. We share a bottle of House Wine, a smooth blackberry Chilean Merlot (a reasonable £ 16.95), which partners our food well. Rather than a bottle of water, we have a jug of tap water – unfortunately it’s tepid in temperature so need to ask for glasses of ice to chill it down. On this Thursday evening, the Bar is buzzing next door and the restaurant is pretty well booked out with happy diners all around, as well as couples sitting with drinks outside on the patio terrace in the late summer sun. My next course is Pan Fried Sea Bass with King Prawns – with a side order of Hand cut Chips. The fish is delicately pan fried while the spicy prawns, coated in lemony sumac, are served cold – tossed into the lettuce and red pepper salad. This would be a superb healthy meal – if I had not ordered the big fat chips.! 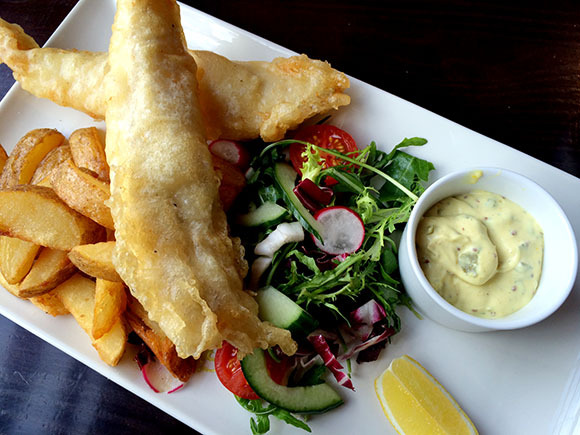 Fiona is tempted by an absolute British classic – you can resist Tempura Battered Haddock and chips, with cucumber, radish and tomato salad. (again, the healthy, low calorie part of the dish). 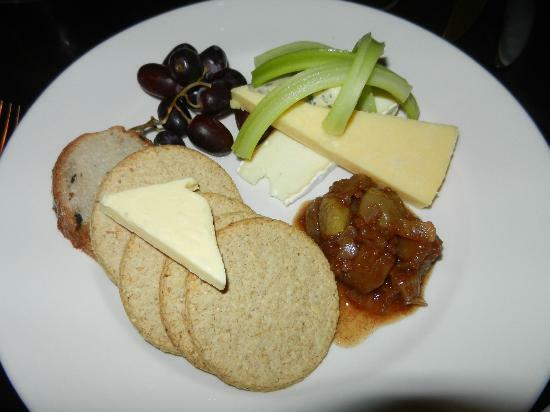 Cheese – Scottish & European with oatcakes, crackers, chutney, grapes and celery. As well as Dinner, why not call in to sample the excellent value Lunch and Pre-theatre set menus at just £ 12.95.£14.95 for 2/3 courses. 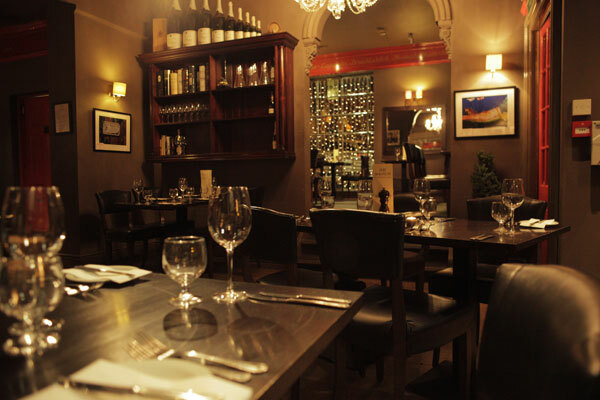 With offices nearby around St. Andrew Square, it’s a handy pitstop for a business lunch or after work drinks with colleagues. 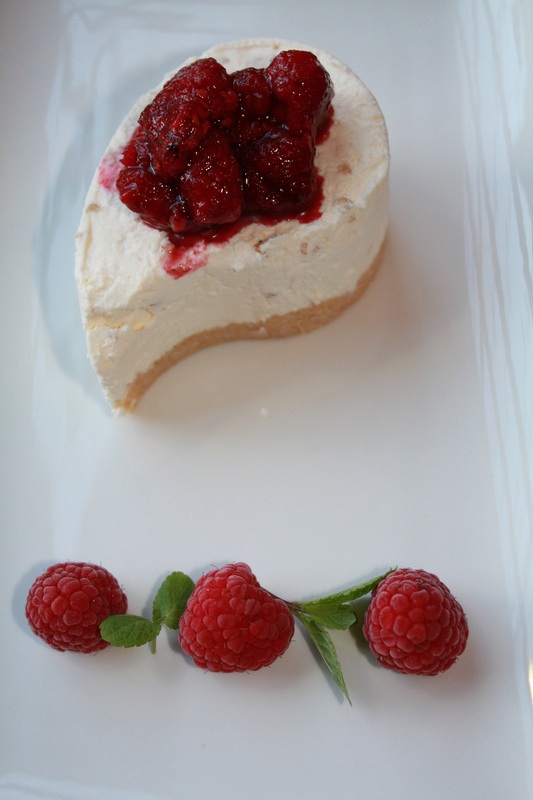 There’s a private dining room catering for up to 26 guests, ideal for a birthday party or celebration with family and friends. With a comprehensive wine list (17 by the glass), champagne, beers, ales and spirits, the Bar has over 70 whiskies from smokey Islay Malts to Highland, Lowland and Speyside Scotch. The Restaurant owner, Chris Graham, has a motto for the Magnum -“good food, good wine, good time.” Following our experience, this is certainly a fact. 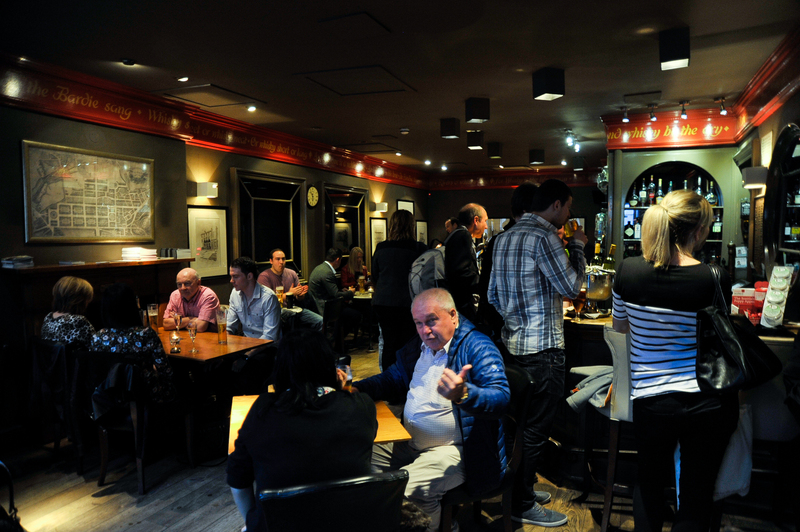 With a friendly welcome and lively banter in the bar, no wonder drinkers and diners, visitors and locals, have been coming here for nearly 35 years. “Fantastic pub / restaurant. I had steak, the best I have had for quite a while. 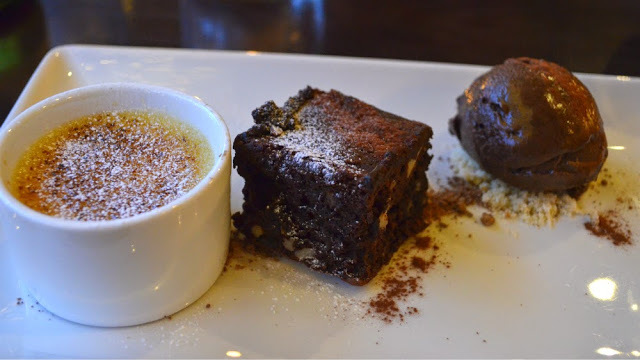 The pudding was heavenly – chocolate sponge with chocolate ice cream on top. Great meal”. Your table is waiting at The Magnum for drinks, lunch or a slap up supper. Cheers! 1 Albany Street, Edinburgh EH1 3PY.